In 1890, J.F. Wiltshaw formed a partnership with two Robinson brothers and entered a field of manufacturing which was already dominated by others. It is fair to say that by adhering to strict quality control they not only survived but became a market leader themselves. Their early products were Victorian Blush Ware, very popular at the time. An early example would probably cost you about a week’s wages today. At the turn of the century, they added a new line of Crested Ware, and again, high standards of manufacture soon gave them a good name within the market-place. The further introduction of matte black ware with floral decoration and a range of ‘cloisonne’ ensured their success. Even though they were in an enviable position, things were not going well within the company heirarchy. In 1911, the Wiltshaws and the Robinsons had major disagreements. The outcome was to be the retreat of the Robinson family, and the direction of the company passed solely to the Wiltshaws. James Wiltshaw brought his son, Cuthbert, into the company, but, when WW1 started, Cuthbert enlisted in the armed forces and earned fame as a Fighter Pilot. In 1918 Cuthbert returned, and almost immediately his father was killed in a railway accident. Cuthbert Wiltshaw was to succeed in establishing the name of Wiltshaw Robinson, later to become Carlton Ware, as a top quality manufacturer for nearly the next fifty years. The introduction of ‘Oriental’ designs between the two World Wars, combined with a series of Lustre finishes, put Carlton Ware at the forefront of the market. Designs such as ‘Paradise Bird and Tree’, and ‘Secretary Bird’ are probably the most sought after today. Other popular designs include ‘Fantasia’. The Copeland Street works was a veritable hive of activity in the 1920’s and 30’s. By the late 1920’s, the range had expanded to include more modestly priced tableware, and Carlton was the first manufacturer to offer ‘Oven to Table’ wares in 1929. Cuthbert Wiltshaw bought out the company of Birks, Rawlins and Co in 1928 with the intention of using the plant to produce bone china and also as a decorating shop. Sadly, the excessive cost of running the new facility resulted in its closure in 1933. The ‘Registered Australian Design’ conundrum – Dealers and collectors often puzzle about this particular backstamp. It was in use from c1935 to c1961. The facts…. By the mid 1930’s, the Japanese had become very proficient in copying good quality wares and Carlton Ware was an obvious target for them. Their prices for the imitations were considerably lower than the genuine originals. Cuthbert Wiltshaw discovered a clause in the ‘South East Asia Treaty Organisation’ which concerned Australia and Japan, to the effect that designs registered in Australia could not be copied by the Japanese. He took advantage of this situation and registered a large number of designs with the Australians. Hence the unusual backstamps. World War 2 effectively stopped the production of anything except ‘utility’ wares, but, behind the scenes, Cuthbert was busy planning ahead for the years after the war. With the ending of hostilities, the factory was installed with a new oven known as an ‘electric biscuit’ type. This was a far-sighted improvement which made the older style of oven and manufacturing techniques redundant. The wares were now placed on trolleys which were passed through the oven. The products would be gradually raised to their firing temperature and then allowed to cool before passing on to the next step in their manufacture. The benefits were immense – gone were the days of filling saggers and then having to load them all into an oven before the whole thing could be fired . Production runs could be changed at almost a moment’s notice, and smaller batches could be accommodated easily. In this same period, the lustre ranges were ‘standardised’. The Royale colours were defined as Bleu, Rouge, Vert and Noire (Blue, Red, Green and Black). Apart from the black, these new colours were easily distinguishable from the pre-war versions. New hand-painted decorations were added to include Spider’s Web, New Mikado, and New Stork. In parallel with the ‘finer’ wares, fruit and floral designs continued and were increased to include Hydrangea, Vine and Grape, Poppy, and Daisy. The 1950’s was probably the most productive period in the Carlton Ware history. Most of their pieces now contained the word ‘Handpainted’ on the backstamp, regardless of whether it was or not. Windswept, Leaf and Pinstripe were added to the range and a steady production of lustre wares was maintained. In 1958, the company officially changed it’s name to Carlton Ware Ltd, but there were poorer times ahead. Cuthbert Wiltshaw died in 1966 and in the following year the company was sold to Arthur Wood and Son. Anthony Wood, the son of Arthur Wood, took over as Managing Director in a period which saw fuel prices soar. This aspect, in addition to a number of Trade Union problems, almost saw the factory close down. In the early 70’s, Roger Michell and Danka Napiorkowska were recruited to develop their own designs. This led to the introduction of the ‘Walking Ware’ range. 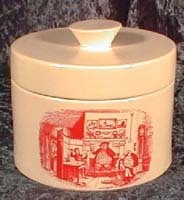 The Walking Ware gained immediate popularity, and it was probably this series that kept the company afloat during the 1970’s. Anthony Wood tried to re-introduce some of the earlier pieces, but nothing else caught the public’s imagination. The recession in the early 1980’s saw the factory in even more distress, and in 1987 the company was bought by County Potteries Plc. They were a holding company who already owned the James Kent works. The stated intention was to rebuild the ailing pottery industry around Stoke-on-Trent, but this aim was never to materialise. A brief production run at the James Kent works carried the name Carlton Ware, but with little success. Eventually the Receivers were called in to the Copeland Street works in 1989. In May of 1989, John McCluskey purchased from the Receivers the Name, shape and pattern books, a quantity of moulds, and the goodwill. 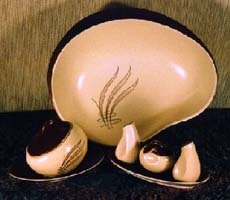 Production of Carlton Ware resumed in 1990, but sadly ceased again in 1992. The name then remained dormant until 1997 when Francis Joseph acquired it together with a small number of moulds and a few pre-production models. It is a tribute to Francis Joseph and Carlton Collectors that today the name has been rejuvenated and the products being made are once again eagerly sought after. One sad aspect to the story is the amount of material which has been lost. Patterns and shapes appear regularly which do not exist in any of the known records. Given time and a very enthusiastic Collectors Club, possibly the entire history of Carlton Ware and its pieces can be re-constructed.